Vancouver’s eatART foundation, and its mechanical sculptures, combine artistic whimsy and engineering know-how to illuminate energy issues. At the Consumer Electronics Show in Las Vegas this past January, while attendees perused the latest gadgets inside, those outside the annual event clamored around two mechanical beast: a car-sized, eight-legged walking machine called the Mondo Spider and Titanoboa, a 35-foot-long robotic snake. 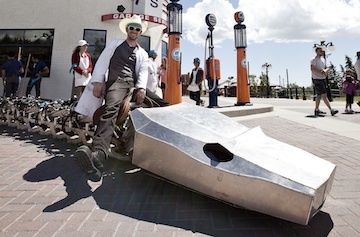 Both mechanical sculptures are the work of Vancouver-based eatART (Energy Awareness Through Art). Composed of young artists, mechanical engineers and fabricators, the non-profit arts research foundation is part Maker Movement and part environmental advocacy plus a generous portion of Burning Man-style artistic expression. 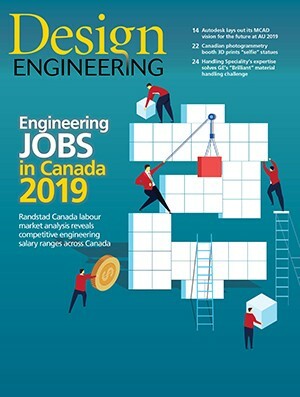 In part, the story of eatART, and its creations, began in 2006 with a small group of University of British Columbia engineering graduates: Charlie Brinson, Leigh Christie, Jonathan Tippett, Alex Mossman, Sam Meyer and Ryan Johnston. Inspired by reality shows like Junkyard Wars, the group organized a local version of the competition to create a walking machine. That original mechanical collage of wood, bike parts and door hinges traveled only 20 feet before collapsing; however, their initial success—plus encouragement and start-up capital from Brinson’s father, Dillard Brinson—inspired the band to try something more robust and stylized. 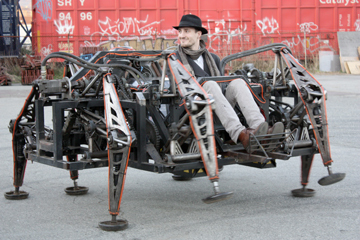 That inspiration became a car-sized, eight-legged walking machine called the Mondo Spider. After extensive modeling in Solidworks and MATLAB, the group secured a grant from the Burning Man arts festival and a workspace in Vancouver’s Great Northern Way Campus, donated by eatART co-founder and video game entrepreneur, Rob Cunningham. With the help of numerous volunteers from the area’s universities, the expanding group fabricated the 1,700-lbs. Mondo Spider in time to creep its way onto Nevada’s Black Rock Desert in August 2006. For all its seeming complexity, how the Mondo Spider works is relatively straightforward, Christie says. The most complex part—coordinating the walking machine’s eight legs—relies on the work of inventor Joe Klann and his six-bar linkage made up of pivot joints that convert rotating motion to linear. Each pair of legs (front and back) is connected to a central input crank and set one-half cycle out of phase with each other. With each 180-degree turn of the input crank, the grounded leg travels forward (or backward) in a straight line. At the same time, the opposite leg is raised the off the ground to a predetermined height before returning to the starting position. By timing the four pairs of legs (two pairs on each side) 90 degrees out of phase with each other, the Mondo Spider always has four feet on the ground to keep the frame and rider relatively parallel to the ground, but the trip isn’t always smooth. Constructed from mild steel, the Mondo Spider was originally powered by Honda VTwin engine, which has since been replaced by a 16 cell, 48V lithium iron phosphate battery. Each side of the walking machine is driven by an independent hydraulic system designed by Alex Mossman and regulated by a hand-operated proportional valve. By manipulating the valve levers, a driver can move forward, backward or skid-steer the Mondo Spider like a tank. At top speed, the mechanical beast tops out at a brisk walking pace of 4 ft/sec but relies on its 1,180-ft-lb of maximum torque to keep its 8 x 8 x 5-foot frame moving. With the completion of the Mondo Spider and its viral notoriety following Burning Man 2006, Christie, Brinson, Tippett, Cunningham and others decided to join forces to formally establish eatART on the Great Northern Way Campus as fabrication facility and exhibition space. In the following years, the organization continued to tour its projects, until Brinson conceived the group’s next big thing. As with the Mondo Spider, the first step was proving it could be done. In the fall of 2010, Brinson started work with then-Swiss Federal Institute of Technology (ETH Zurich) student, Federico Augugliaro, to create the mathematical models, early mechanical design and FEA analysis. 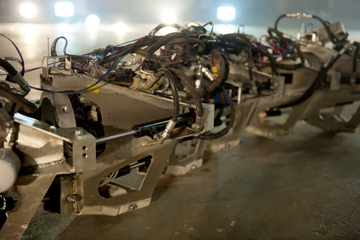 Connected by Cardan joints, the Titanoboa’s 20 vertebrae are actuated by 40 proportional hydraulic cylinders and coordinated by a series of Arduino controllers. (Photography by Ben Z Cooper). Unlike the Mondo Spider, however, Brinson says Titanoboa required significantly more complicated controls and multi-disciplinary expertise to create. Constructed from high-strength aluminum, the robotic snake’s motion replicates that of its namesake—twisting the length of its body back and forth. Its 20 vertebrae are connected by Cardan universal joints and grouped into 5-vertebrae modules that each function as an independent system. Each module is controlled by an Arduino micro-controller that takes inputs from 10 valves to control 10 proportional hydraulic cylinders—two per vertebrae. In turn, each module communicates with the others as well as with the robot’s central controller in the head. A driver operates the electrically powered robot by wireless remote. Although the wheels worked well on hard, flat surfaces, it was less successful on the desert floor at Burning Man 2011, he adds. Since then, the group has been working to upgrade Titanoboa to fulfill the project’s original vision. 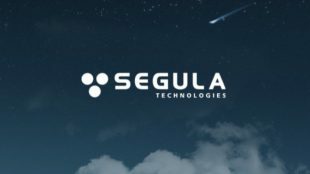 For example, to give it more versatility, mechanical engineer and eatART core contributor, Hugh Patterson, designed belly scales and approached ProtoLabs to rapid prototype them from slick polyethylene resin. Impressed by the project, the company donated 100 of the artificial scales, which the team is in the process of installing. In addition, Brinson says they will be adding the final 10 vertebrae this summer to bring Titanoboa to its intended 50-foot length and programming other modes of snake motion including caterpillar, concertina and sidewinder.